George addresses the Fathers Day crowd at the Bethesda Big Train Game before throwing the first pitch. 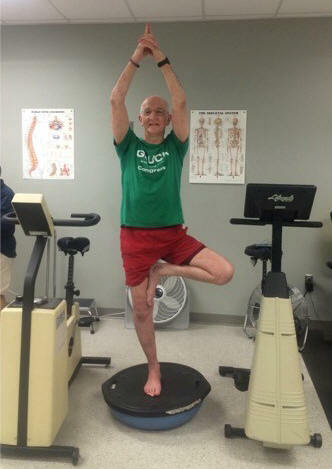 Click on this link to hear and see George's "pitch before the pitch." And here's the other pitch! Click on this link to listen to George's 4/23/16 interview by Dave Schmidt of WFMD, Frederick. Learn about George's proposal for progressive property taxes here. George asking the Montgomery County representatives to the Maryland legislature to enact an Instant Runoff Voting bill. See George's YouTube video statement for his 2014 District 6 campaign. See George's video about Medicare for All. 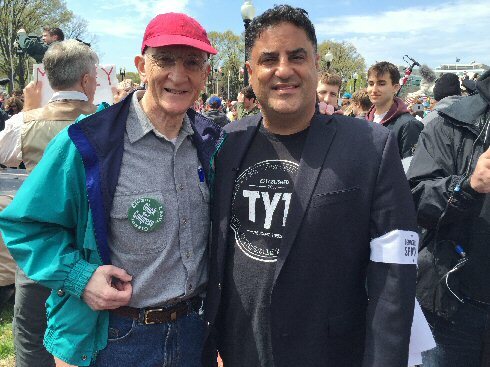 Click photo for a video of George at the Green Party's July 2012 Presidential Nominating Convention. He's discussing fixing high-priority national problems such as reversing the Citizens United decision, and restoring our education system. Click the photo below to hear George's Sept. 2010 testimony against the proposed Lockheed-Martin tax exemption. 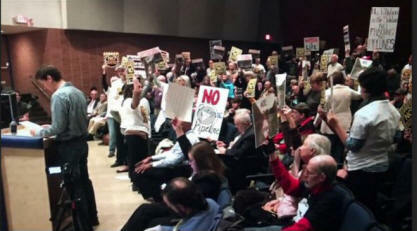 Several hundred citizens gathered Tuesday night at Hancock High School to protest the granting of a permit to Trans-Canada to build a gas pipeline under the Potomac River. There was not enough time for representatives of the Maryland Department of the Environment to hear the objections of 70 or more speakers. Here is my (shortened testimony). Mar. 28, 2017 If you read no other book during the Gorsuch-Ryan-Trump era, please consider reading Yale history	Professor Timothy Snyder’s “On Tyranny: TWENTY LESSONS FROM THE TWENTIETH CENTURY.” A list of the twenty lessons may be found here and an interview of Professor Snyder may be found here. Exactly two years ago today, I fell and broke two bones in my right leg. A week after the surgery, I had but one question for the orthopedist: “when can I run again, doc?” I knew his “six months” response was an average, so I responded, “Okay, five months.” After working hard, four months and three weeks later, I resumed running. On November 8, 2016, we definitively discovered (as many of us have suspected for quite a while) that our electoral system is badly broken. After working hard together, we will ALL again be able to vote in the confidence that the ballot contains the best candidates that our parties have to offer and that all our votes are counted. 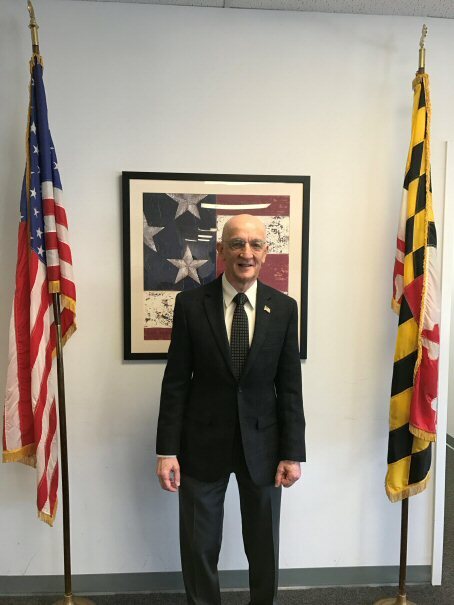 It is in the hope that this happens as soon as possible, that I have registered today, the first day possible, to offer the voters of Maryland’s 6th Congressional District a Progressive choice in 2018. “The long arc of history bends towards justice.” - Martin Luther King, Jr. at Forest Hill's Holy Blossom Temple in March 1962. Today, I urge my Democratic friends listen to the first half of this podcast,	where Dr. Robert Reich forecasted the present state of the Democratic Party in 2001 and suggests what progressives ought to do now to correct the situation. 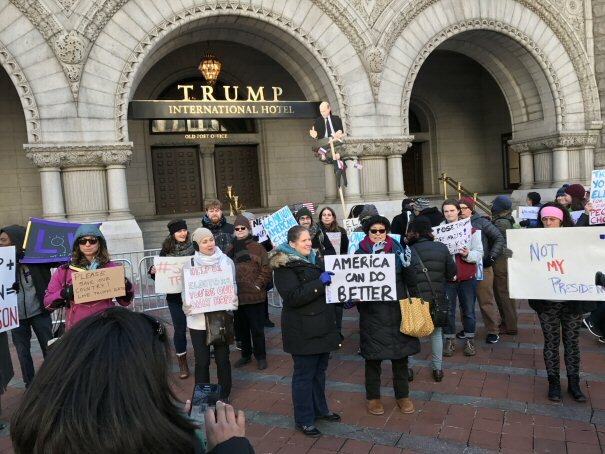 As women return home from marches in cities throughout the United States of America today, here are a few of the many, from coast to coast, that I met at the Navy Memorial,	the site of the largest protest on the Inaugural Parade Route yesterday. Above is millennial,	Kayleigh Smith, a photographer from Brooklyn, where my wife and I met in high school. 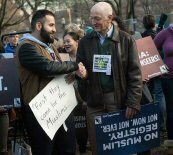 She was among the most vocal to my left along the security barrier as President Trump moved quickly before us on his drive to the White House. And to my right were a daughter, her mother and her grandmother. At home, in Frederick, Maryland was her 100-year-old great-grandmother, hoping to see them on television. 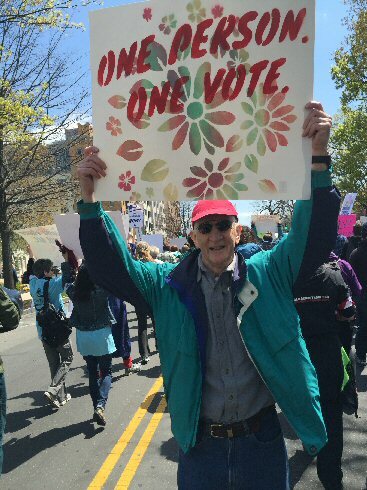 Millions of women (and men) of every progressive stripe, of all ages, and races peacefully demonstrated this weekend and promised to continue to do so. At the beginning of this historic year for our country, I hope we can each resolve to try to make a collective difference. How many people attended an anti-nuclear protest in NYC in 1982? About 1 million, while over 2 million attended a 2013 rally in Chicago to celebrate the Stanley Cup Champion Chicago Blackhawks! 3. Search for “net neutrality” at	washingtonpost.com with results that mention nothing about net neutrality. Search for “net neutrality”	at theguardian.com and the first three headlines begin with those two words. For entry into the news knowers, who said “I’ve never seen anything like this, and this going to be a very good year for us. Sorry. It’s a terrible thing to say. But, bring it on, Donald. Keep going?” The answer:	CBS Chief Les Moonves Says Trump’s ‘Damn Good’ For Business. What do MSNBC, CNN, the Washington Post and other major media corporations have in common? 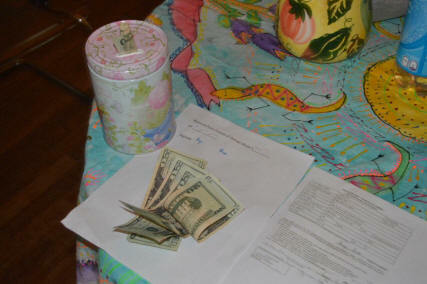 A large income from advertising purchased by transnational corporations and major party candidates. What might happen if these “mainstream” media organizations showed their advertisers in less than the best light or offered opinions that countered the wishes of these clients? Look, we all want to improve on something this year. Resolve to gain unbiased, complete news information, and then you’ll make informed decisions. * Disclaimer – A friend, a well-respected and award-winning journalist, takes exception with some of my concerns about “mainstream” media. Please let me know your feelings. Click here to send email to George. 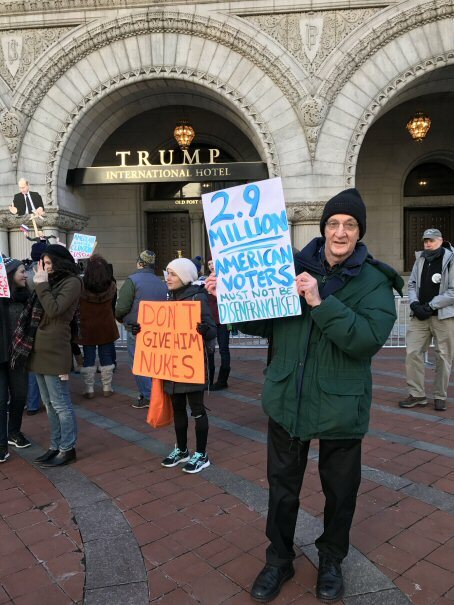 Photos	(below) and videos of George participating in anti-Trump demonstration on Electoral College voting day. Which is the "third" party? I'll accept "None" or "All!" 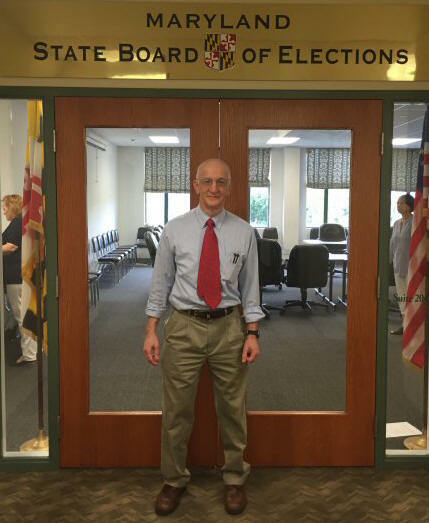 George signs up to be on the November ballot at the MD State Board of Elections. 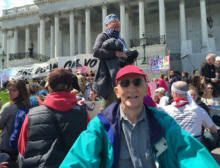 George joined Democracy Spring protesters on a march from Union Station (where he spoke with Cenk Uygur of “The Young Turks”) to the east side of the Capitol, where he sat with protesters. Here is a link to the video. Nov. 18, 2015 George asks the Montgomery County representatives to the Maryland legislature to enact an Instant Runoff Voting bill. Hear proceeding at left, top icon. 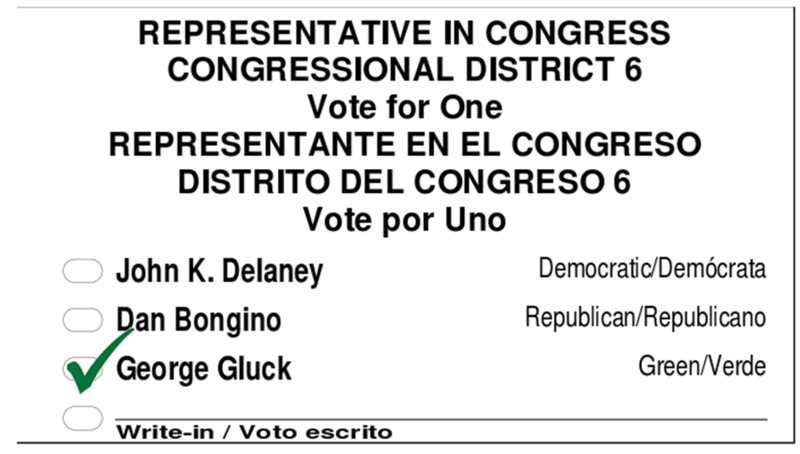 Rockville, Maryland - November 2, 2015 – Citing a need to reverse over a half-century of Republican and Conservative Democratic representation of the citizens of Maryland’s Congressional District #6, Green Party member George Gluck filed today to seek the Party’s nomination for the seat presently held by Congressman John Delaney. Mr. Gluck, 68, has run for office four previous times since 2009, encouraging potential supporters to consider such progressive measures as replacing regressive local property taxes with a progressive tax modelled after the state and federal income tax, greater support for local small businesses, including worker-owned cooperatives and Employee Stock Ownership Plans (ESOPs) and verifiable voting. Mr. Gluck is also committed to encouraging a change in our first-past-the-poll elections in favor of further expansion of a ranked voting method, such as Instant Runoff Voting, which the Green Party and many political jurisdictions (such as the city of San Francisco) utilize. "People understand that the last three decades have favored a handful of very rich individuals over the vast majority of our citizens and most of us, especially millennials, are looking forward to a dismal future unless the tide is turned." 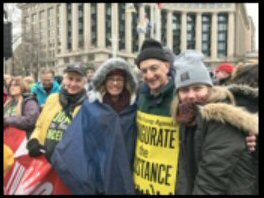 Mr. Gluck, who may have to compete with other Green Party members in their primary, has entered the race early in the hope that he will be invited to all the forums the Republican and Democratic candidates participate in. What to Expect From the TPP! First in District 6 on November 2nd! 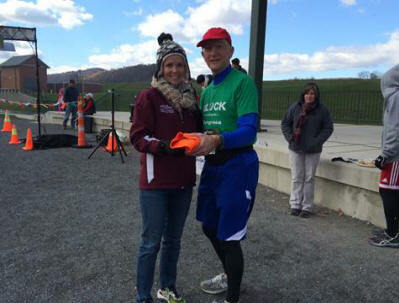 the 60+ first place prize in the Western Maryland Half Marathon. First in District 6 on November 4th? Oct. 31, 2014 George posts his final campaign balance sheet. 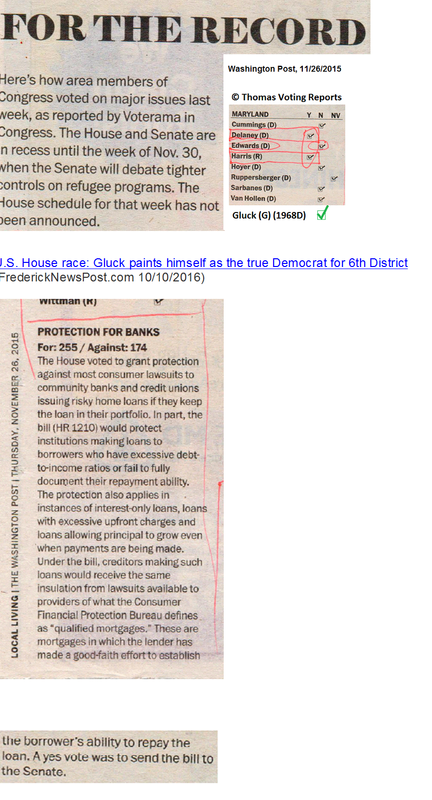 Oct. 15, 2014 The Gazette commends George on his proposed legislation, while they whisper a lukewarm endorsement for the incumbent. 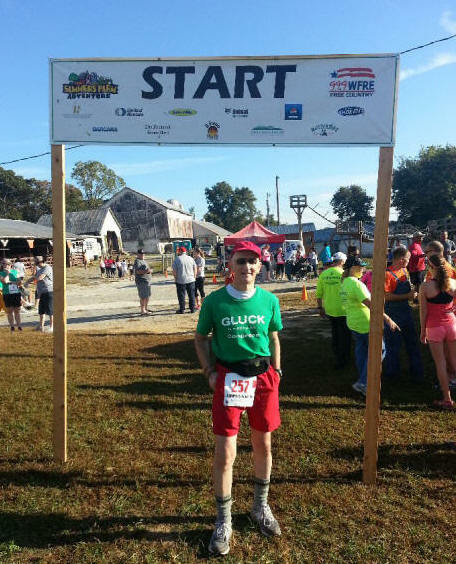 After attending the Hagerstown-Washington County Chamber of Commerce District 6 Congressional Forum, George jogged around the Hagerstown City Park and its environs. On the home stretch, he saw a group of volunteers greeted by thankful residents of city housing. 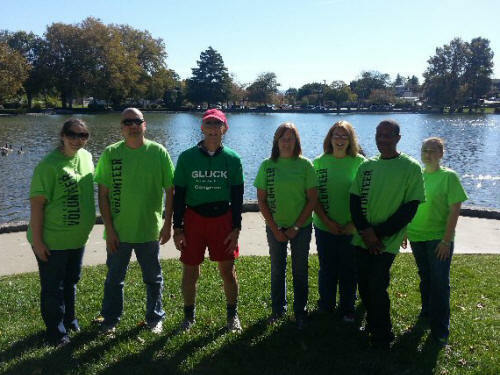 George stopped to thank them for their service before they had their lunch along the edge of the park lake. Oct. 2, 2014 You're invited to "Out of Sight, Out of Mind" The Human Trafficking Symposium Committee of Frederick ... (Oct 2, 2014, 6-9:30 PM) - George supports this initiative and will attend the meeting. Here's the Ballot for November 4 and how to fill it out! 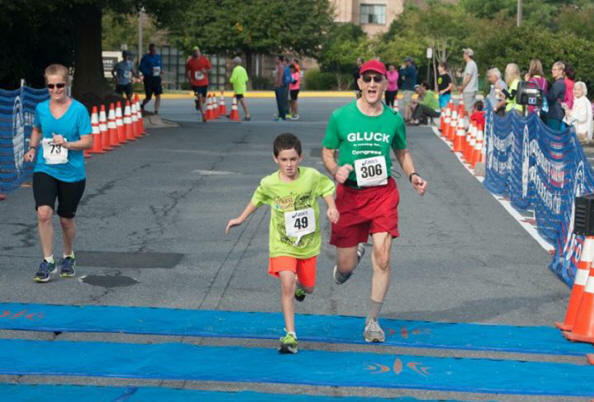 Eight-year-old Caden, running his first 5K, serves as George’s ‘rabbit,’ helping George run his fastest pace of the season! Sept. 30, 2014 George Took the Anti-Corruption Pledge again! George sends editorial to Frederick News-Post protesting the shooting range at Sugarloaf Mountain. Application for shooting range is withdrawn. August 31, 2014 George will participate in a Meet the Candidates forum at the Hagerstown Chamber of Commerce on 10/9. 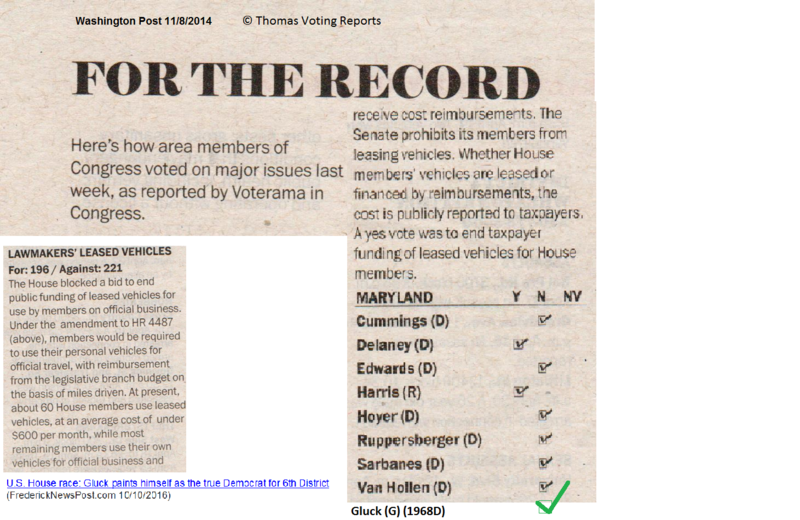 July 9, 2014 George posts a comment to Blair Lee's editorial "It's time for Maryland election reform" on Gazette.net. Click here for article and comment. August 29, 2014: $100 left! 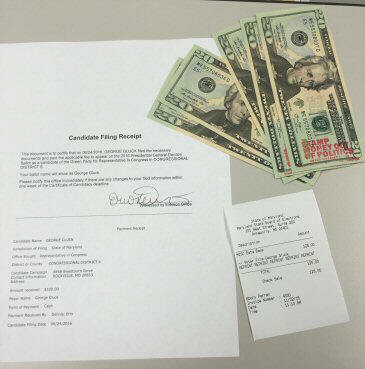 June 25, 2014: George self-funds his Campaign Treasury with $200 cash. Let's see if that's all he needs! The photo and the spreadsheets to be provided will constitute a running audit of the campaign - posted on our Campaign Spending page. Congratulations and good luck to our nominees! 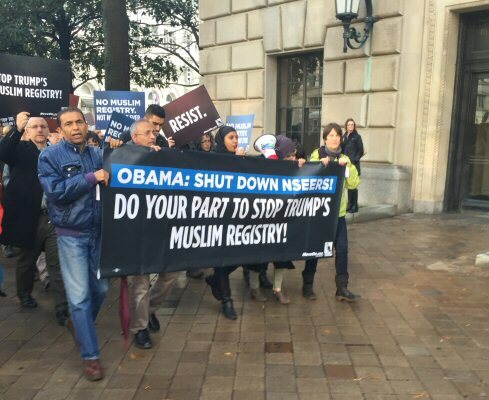 Please visit their websites for more information, to learn how to see them in person and volunteer for their campaigns, and to make a contribution to support their efforts. 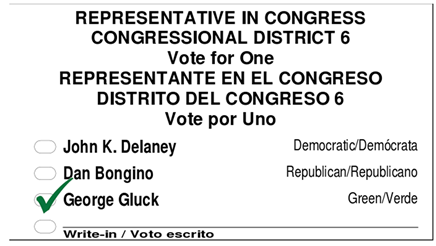 February 10, 2014: George is running for Congress representing Maryland District 6. December 19, 2012: George responds (as pegasus4848) below Gazette article to the controversy about government incentives to attract corporations to buy/lease office space in Montgomery County. 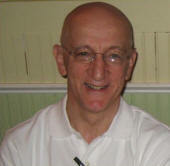 January 27, 2012: George was interviewed in the Frederick News-Post. Story is called "Gluck looks to win 8th District with ‘something else’"
July 12, 2012: Baltimore Sun coverage of Green Party convention - click here to read entire article by John Fritze. 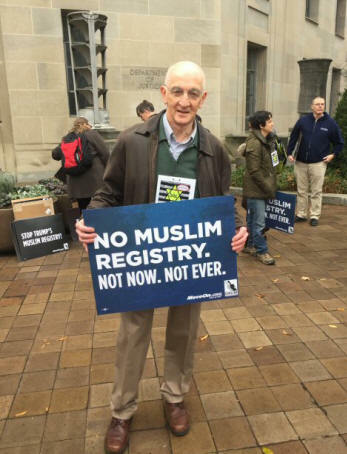 ...George Gluck, a Rockville computer analyst who is running for the House of Representatives in Maryland's 8th District, worked potential voters outside the school, asking them to sign the Green Party's ballot-access petition. Gluck said he was a longtime Democrat who split with the party when President Bill Clinton signed the North American Free Trade Agreement in 1993. "Their generation is going to fix this country," Gluck said, pointing to a couple of 20-something women he had approached earlier for signatures. "I'm hoping to give them a leg up." 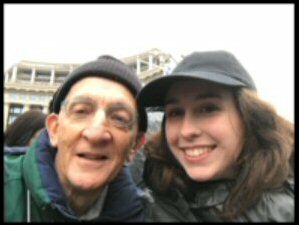 July 2011: George participated in the “Hands Off Social Security” rally. 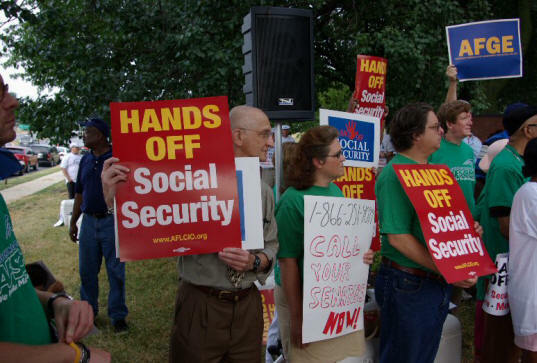 On July 25, 2011, a rally was staged at the Social Security Complex in Woodlawn, in Baltimore County, MD. 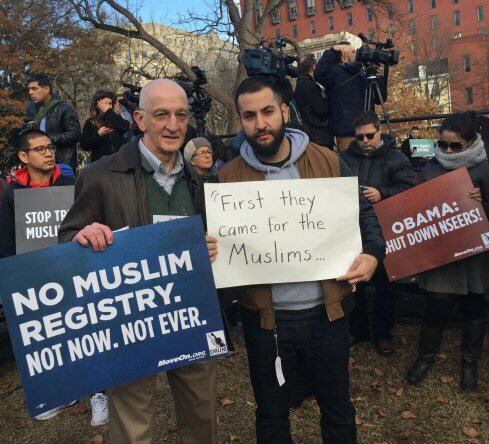 Progressive Democratic of America and other groups. Here is a link to their video. George has proposed common-sense voting procedures called IRV/CRV which would save money on interim elections. See IRV/CRV voting on the Issues page. 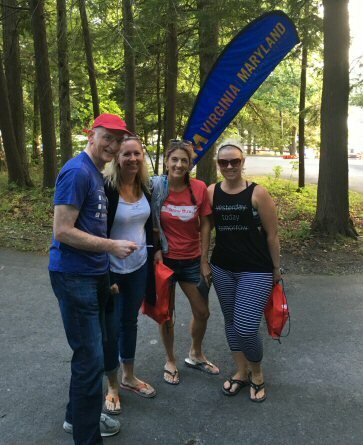 Explore our website - join our campaign - Volunteer or Donate - and in the General Election on Nov. 4th, VOTE FOR GEORGE for U.S. House of Representatives, Maryland District 06. Copyright© 2016. Approved by Citizens for George Gluck, John B. Holland, Treasurer. 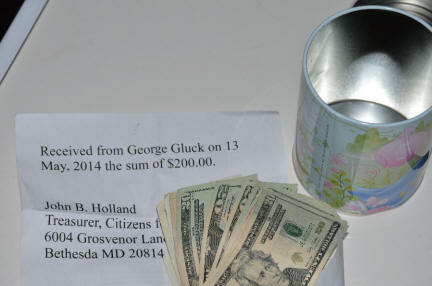 Paid for by Citizens for George Gluck, 6004 Grosvenor Lane, Bethesda MD 20814, 240-413-8378.